With Bailey dispatched, Austin gave LNP spokesman Scott Emerson the opportunity of a free rant, presumably in the name of ‘balance’ with no right of reply for Bailey. Later in the morning Austin told us he had trouble getting people to come on the show! What a surprise! The Australian Energy Market Operator has signed up for 200MW of demand response capacity, creating a “virtual power plant” twice the size of the Tesla Big battery to deal with heatwaves and supply failures – and prevent blackouts – in the heat of summer. The result of the much awaited demand response tender will see 143MW made available this coming summer, and the rest by 2020, in a crucial addition to AEMO’s ability to meet extreme demand peaks and supply shortfalls, and transition the grid to a smarter, faster and cleaner machine. The projects feature a range of monitoring, control and storage technologies, to be installed in homes, businesses and large manufacturers, who will be paid to moderate demand, or switch their use to a different time. This new “virtual power plant” will add to the Tesla big battery being built in South Australia – in total it will be effectively twice the size – and other measures put in place to ease the strain on the grid created by the recent closure of Hazelwood brown coal power generator. All we got in Queensland was noise from the peanut gallery of the LNP opposition in state parliament, guffawing about rotten prawns and warm beer as a Christmas gift from an incompetent Labor government. Some searching of ministerial media releases reveals that the announcement was that something called PeakSmart, already available in SE Qld, would now be available in the regions. Seems there are already 70,000 PeakSmart air‑conditioners installed in South East Queensland, and they are now looking to a further 60,000 PeakSmart-compatible air conditioners in regional Queensland. With PeakSmart you have remotely installed technology so that the grid can access your appliance during what are called load management events which occur perhaps several times a year. Your aircon is not turned off, it is put into economy mode by remote switching, whatever is agreed but I gather 26 degrees is the go, and you are paid accordingly up to $400 into your nominated bank account for this standby reserve facility. The scheme is explained at this Energex site. I’ve heard it was started years ago but was wound back by the Newman government. It’s part of the Positive Payback Program. 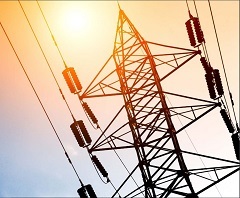 “The Queensland Energy Security Taskforce has worked closely with Queensland’s electricity generators and our networks to develop the Summer Preparedness Plan to ensure that we can respond to these challenges,” Mr Bailey said. Our power stations are ready to generate 11 445 MW of electricity to meet the peak demands of summer, which is more than the predicted peak demand of 9790 MW. We’ve directed Stanwell to put the Swanbank E gas-fired power station back online, which is on track to deliver an additional 385 MW into the Queensland power system from 1 January 2018. CS Energy has improved its operation of the Wivenhoe Power Station to boost the capacity of the pumped storage hydro by 70 MW. Deliver an additional 140 MW of new renewable energy in North Queensland. Complete generator upgrades and overhauls including Callide Unit C4 and Stanwell Unit 3. Expand the Energy Queensland PeakSmart air conditioners program to the regional Ergon network. Ensure government assets have effective procedures in place to reduce demand at peak times. Implement Stage 1 of Energy Queensland’s Virtual Power Plant. The PeakSmart component of the demand savings is reckoned at 58 MW, so clearly there is more to it if 850 MW is being claimed. Energy Queensland’s Energy Services division is partnering with GreenSync Pty Ltd to create Australia’s biggest ‘virtual power plant’. Treasurer Curtis Pitt officially launched the virtual power plant at the Powering North Queensland Summit in Townsville today. Mr Pitt said the virtual power plant was a cloud-based, load control system created to manage extreme electricity demand during severe temperature events. There’s more at The Fifth Estate and One Step Off the Grid. The Energy Queensland-GreenSync partnership was first revealed the night before in Melbourne, at the official launch of GreenSync’s potentially game-changing trading platform for distributed energy resources, called deX, or Decentralised Energy Exchange. As we reported last week, deX is an open exchange where energy capacity can be transacted between businesses, households, communities and utilities, and which promises to transform Australia’s energy industry. I gather that means sharing generated energy as well as demand response savings. There’s more here about GreenSync and deX technology. Queensland has 1.835 GW of installed rooftop solar capacity, as against 5.9 GW for Australia. Agreements allowing the South East to locate generators onsite for network support. A network support agreement exists with an embedded generator of 23 MVA capacity at Bromelton to provide network support during contingencies where transformers or sub-transmission feeders are out of service in the Scenic Rim area. This demand management strategy has been in place for several years. They’ve been doing this stuff since 2006-07. The Power System Summer Preparedness Plan was launched with a media release on 10 October telling us that Queensland was an energy powerhouse, and much of the information already mentioned. 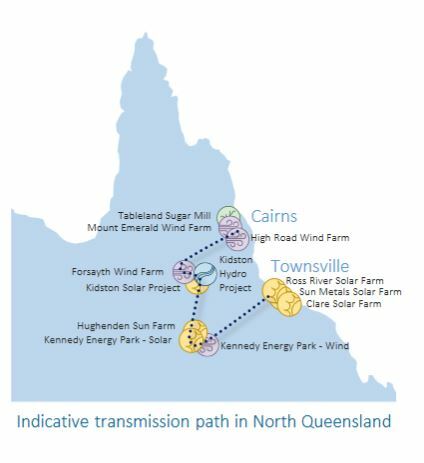 It did also mention the 100 MW Clare Solar Farm as part of the 140 MW of new power in NQ, and the $1.16 billion Powering Queensland Plan. 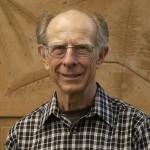 Continue to advocate for stable, integrated national climate and energy policies. The Government also released its response to the Renewable Energy Expert Panel Final Report, re-affirming its commitment to a 50 per cent renewable energy target by 2030 (RET) and consequently will support investment for up to 400 MW of a diversified renewable energy capacity by providing revenue certainty through a reverse auction process, including a 100 megawatt energy storage component. You can download the final report from here. It is long and detailed and has many wondrous graphs, showing Queensland as the champion greenhouse emitter, and the least progressed in renewable energy apart from rooftop solar. The Government response is here. The 5 June media release contained a link to the government website for further information, where we find a list of links. I’ll go through them and pick out some highlights. That’s the plan, details above and below. Achieving a 50 per cent renewable energy target has the potential to deliver broad benefits to the economy, particularly in regional Queensland. The Expert Panel found that the target could drive $6.7 billion of new investment, and deliver a net increase in employment of 6400–6700 full-time equivalent positions on average per year between 2020 and 2030. Queenslands current fleet of generators comprises 8,200 MW of coal, 2,700 MW of gas, 1706 MW of rooftop solar, 700 MW of large-scale solar and 500 MW of pumped storage and hydro. The key metrics are over 830 MW of large-scale projects commencing construction or finalising commercial arrangements, to spend $1.6 billion and create 1400 jobs. There are a further over 4000 MW of projects in the pipeline in North Queensland. Eleven projects are listed. Quite a lot, really, including providing over $1 billion between 2015–16 and 2016–17 to subsidise regional Queensland consumers through the Uniform Tariff Policy, so that they get the same tariff as the standard offer in SEQ, directing Energex and Ergon Energy not to challenge the Australian Energy Regulator’s decision on network revenues, thereby locking in lower network tariffs between 2015 and 2020, removing the cost of the Solar Bonus Scheme from electricity bills at a cost of $770 million to the budget, and directing Stanwell Corporation to undertake strategies to place downward pressure on wholesale prices. The Government is investigating the establishment of a separate ‘CleanCo’ generator to operate Queensland’s existing renewable and low-emissions energy generation assets and develop new renewable energy projects, with a report due early in 2018. The Government is also implementing a Queensland Gas Action Plan to deliver a range of initiatives to increase gas supply and reduce barriers to market, including releasing more tenements for development in the Surat basin. A 50 per cent renewable energy target could drive $6.7 billion of new investment, and deliver a net increase in employment of 6400–6700 full-time equivalent positions on average per year between 2020 and 2030. A range of measures, like providing $170.1 million over four years to extend the Electricity Rebate to federal Health Care Card holders and asylum seekers, $10 million over two years to implement a package of support for regional business and agricultural customers in managing power bills, solar PV for public housing and state schools. The Government is conducting a reverse auction for up to 400 MW of renewable energy capacity, including 100 MW of storage. An expression of interest process closed on 25 September 2017 yielding proposals from 79 local and overseas businesses submitting 115 project proposals, offering nearly 6,000 MW of energy storage and 9,000 MW of renewable energy comprised of wind, solar (including integrated photovoltaic (PV) with storage and solar thermal), and biomass. Shortlisted proponents will submit binding bids in November 2017. So there was quite a bit that Steve Austin missed that Tuesday morning. On Monday this week he was at it again, because of news that the ACCC had released its final report on affordability. We heard from Mark Bailey again who told us that whereas SA had seen retail prices increase by 19% in July and NSW by 11%, Queensland’s prices had been held to 3% (actually 3.3%). Queensland, he said, had the lowest wholesale prices in Australia. In fact the Palaszczuk government had restricted price rises to about 5%, whereas under Newman they had risen by 43%. (That claim has been made repeatedly and is in the media releases above). Regional consumers are being subsidised by $600 million this year. With government ownership the Queensland government was using its levers to keep prices down. Bailey did say that there was a dividend taken to support schools, hospitals, etc. but no, he could not give its dimension off-hand. This is a perennial. We have to remember that Queensland voters want government assets unsold so that the profit goes to the benefit of the people, rather than to private companies. There is more of relevance in Bailey’s media releases Regulator decision locks in Queensland’s electricity price stability and Paying the dividends forward to benefit all Queenslanders. Unbelievably, after Bailey was finished Steve Austin again gave a free shot at him to Scott Emerson and Pauline Hanson. Nothing substantial was said, and I only remember Hanson raving about coal. Later in the morning Austin had his regular political chat with Graham Young for the Liberals, a climate denying, free-market ideologue, who thinks the Palaszczuk government is entirely useless and never recovered from the shock of winning to actually do anything. Other than that he is often worth listening to. Labor was represented by retired Brisbane Lord Mayor Jim Soorley, who happens to be on the board of CS Energy, the government-owned power generator. Soorley, with Young continually talking over him, told us that they had done the figures on a new coal power station in NQ. The figures don’t add up, not even close. Then they looked at doubling Kogan Creek, where coal was more accessible, and the infrastructure for the existing plant foreshadowed expansion. Again, the figures did not add up. Soorley told us that CS Energy had only made a profit in recent years when prices went up. Prior to that it had to be rescued by the government. 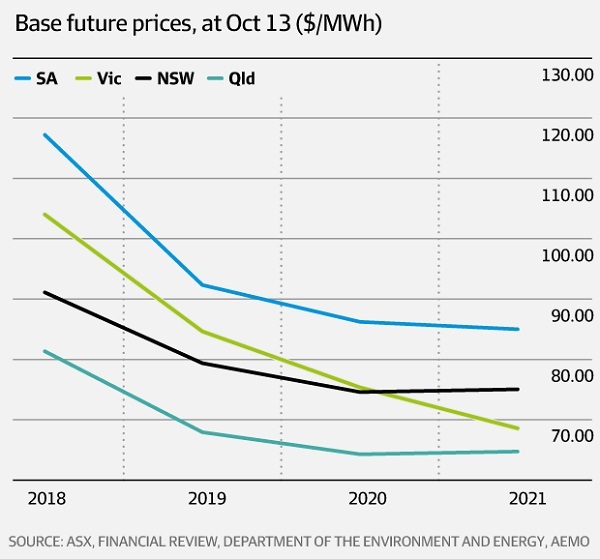 Soorley told us that electricity prices in Queensland over the last five months had been the cheapest in Australia. He also said that when the wind doesn’t blow in South Australia, prices go up in Queensland. This outraged Young, who said it is ridiculous to think we send electrons to SA. We don’t of course, but SA turns up the gas, and imports more from Victoria, which in turn calls in more from NSW which does the same from Queensland. What Soorley didn’t say, but I think meant, was that at each stage the gas is turned up and with it the prices. My observation is that the process is partly ameliorated by Victoria and NSW drawing more from hydro, and in some cases the wind does blow in those states when calm hits SA. This still leaves ACCC supremo Rod Sims and others having to explain why public ownership and a consolidation of production energy ownership in public hands in Queensland is such a bad thing. 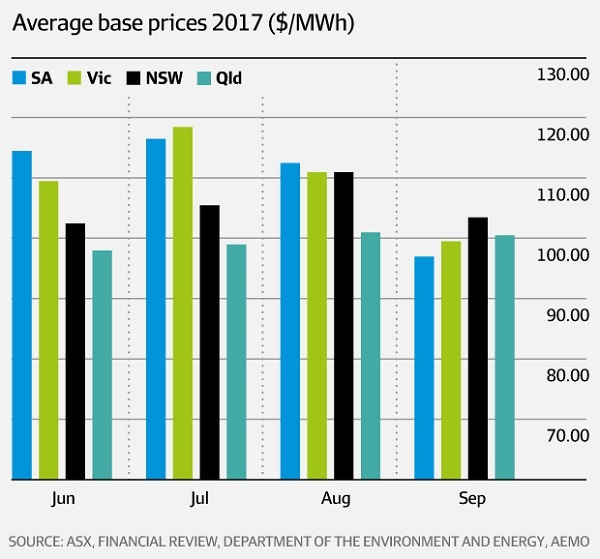 Queensland did have high prices in December-January, when demand locally reached record levels locally and from southern states, and blackouts were caused on 10 February. As I’ve reported before, these went unnoticed in the press because renewables were not involved. Here in fact five coal plants melted in the heat, with more than 790 MW of power failing. Unfortunately the consequent price spikes on the spot market gave rise to a story about ‘gaming the system’ which is still out there although the AER investigation found otherwise. One can see from the above, however, that comprehensive preparation is being taken to avoid any accidents this summer, with an election due early next year. As a footnote, yesterday on local radio, after all we heard, an engineer texted in to Steve Austin’s program telling about having worked on a scheme a few years ago at Energex where they were turning off home airconditioners for short periods in the Brisbane northern suburbs during peak demand periods to save energy. He suggested a phone call to Energex. Steve said it sounded a good idea, and he might just do that. If he does, he’ll get the story he missed last week, when he thought it important to hold a politician ‘accountable’ to some ill-formed idea he had in his head, rather than just have a civil conversation. It’s not hard, Steve. Suggest you compare how Damien Carrick goes about it when filling in for Patricia Karvelas on RN Drive. Meanwhile, Queensland is an example of yet another state that is busy planning a sensible future, with targets more ambitious than the Commonwealth, and more in line with what the Climate Change Authority recommended before it was knackered by the fossils in Canberra, using reverse auctions to mobilise investment. Update: I forgot to mention that Soorley reckons that when Campbell Newman shut down Swanbank E they had a contract for 20 years supply of gas. They would have made a mozza by selling it, and gas will never again be available at the price they had then. 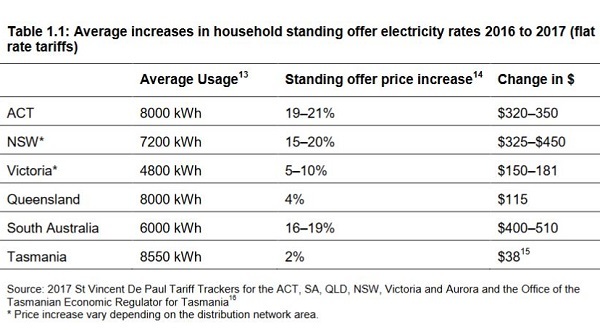 Also the Courier Mail ran an article on the shock horror of electricity prices as revealed in the ACCC report. It was all shock horror. I was intrigued by the claim that $843 of an average household bill went on network costs. Problem is, that our bill clearly shows network prices at $1 per day, which, when you add GST, comes to $401. I checked the ACCC report, and you can find graphs in there which support the CM claim. It makes me wonder about the report. That supports Queensland minister Mark Bailey’s story. However, I have a problem with the 8000kWh usage. Our latest quarterly bill if you multiply by four shows a 4-person household in our area using only 6550kWh pa. People may use more on average in the summer, but last time I looked the average household had fewer than two people. Sorry about the length of this post at just over 3000 words, but I think there is some value in doing a comprehensive picture. I suspect I could do a similar treatment on Victoria, and SA, not sure about NSW, Tasmania and WA. I’d also like to comment on using government media releases and websites. seems to me that the majority of journos these days are working in PR of some shape or form, rather than for the media. I have some sympathy for the likes of Steve Austin and the small team who put together a couple of hours of radio each morning. Their email inboxes are no doubt flooded with media releases. However, I don’t have sympathy for the way political journalists harrass and bang on during interviews, trying to extract answers, when media-trained politicians are trying to communicate without providing a ‘gotcha’ moment. A lot of time is wasted, and political discourse is not enhanced. I was struck last year during the election when the best political interviews were provided by our local radio Drive host, Emma Griffiths, who called in pollies and conducted a respectful interview. Pollies relax and give a lot more out under these circumstances than you ever get from the highly paid ‘gun’ interviewers like Leigh Sales, and Kerry O’Brien before her. Brian: I was impressed by the way the Brisbane public responded to the water crisis several years ago. A similar thing could happen with air conditioner owners during a heat wave. It would take an enormous amount of stuffing around to pay people to change their setting. John, the beauty with PeakSmart, of course, is that you don’t have to stuff around. You get the software, do the deal, and it all happens automatically. I forgot to mention that Soorley reckons that when Campbell Newman shut down Swanbank E they had a contract for 20 years supply of gas. They would have made a mozza by selling it, and gas will never be available at the price they had then. Mark Bailey’s media release ACCC report shows Labor lowering costs, LNP drove electricity prices up selects all the choice bits from the ACCC report. Brian as I recall from discussions of the past on per capita electricity consumption 7000 kWh is the figure that comes up for Australia while 4000 kWh is common for the UK, but then they use a lot of gas for water and space heating. Data point: my factory Origin electricity price at present is 24 cents per unit, about the same as it would be in NZ after discussing this at dinner with a friend from ChCh. Brian, am very impressed by all that amassed knowledge (with me not really knowing anything about the AUS situation). I just wonder, whether a lot of future scenarios include enough of the electro mobility coming towards us. For example here in Norway the number of electro-vehicles is impressive. A private request: Have tried to send you various items over the last month or more, but all mails are boomeranging. Send me the correct e-mail-address please. The Palaszczuk Government will use the benefits of public ownership to cut $125 a year from household bills and $120 off small business bills as part of a $2 billion Affordable Energy Plan. Energy Minister Mark Bailey said the Palaszczuk Government would also ensure power bills for regional homes and small business are kept below average inflation over the next two years shielding Queenslanders from the broken national energy market. Mr Bailey said customers in regional Queensland could go to the Ergon website from today to register their interest in a new initiative- Ergon’s ‘Easy Pay Reward’ to help businesses and households save on their electricity bills. There more if you go to the link. The plan was announced at a media conference at 8.30 am. At around 9pm Steve Austin on local radio interviewed someone to tell his listeners all about it. Would you believe, that someone was Josh Frydenberg. In the ensuing segment no-one from the Qld government was interviewed. We heard a lot of false and cherry-picked information, all of which painted the Qld government in a poor light. Nowhere were we told that from July 1 price increases in Qld were held to 3.3% for residences and 4.1% to businesses, considerably less than other states other than Tasmania. The new press release contained a promise to hold prices to CPI inflation over the next two years, if re-elected, of course. Nowhere were we told that prices went up 43% under the Newman government.